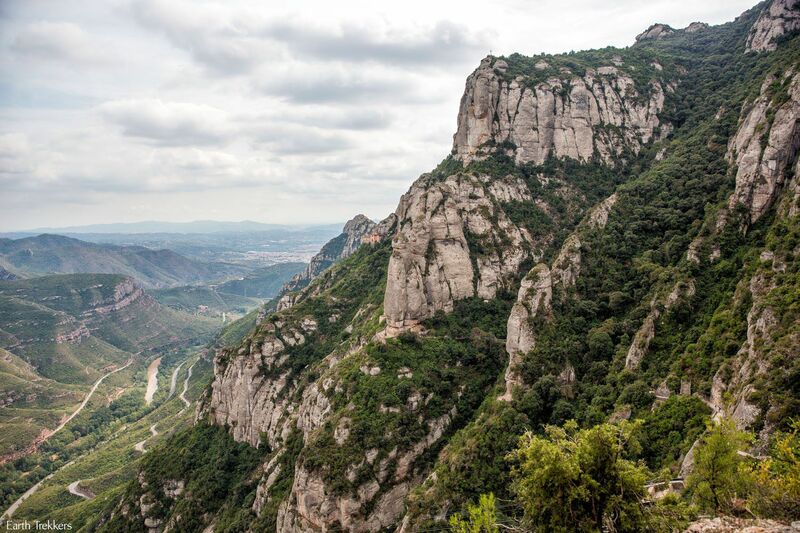 A visit to Montserrat is one of the most popular day trips from Barcelona. Many people come here to view this unique, jagged, sawtooth mountain range and its views over the stunning countryside. Montserrat truly is a beautiful place to visit. One of the best ways to get to the top are on your own two feet. 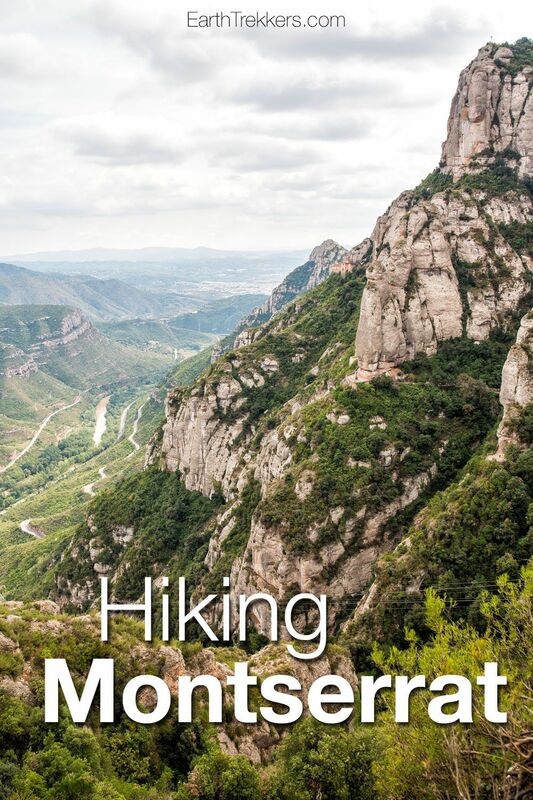 Keep reading to learn more about hiking Montserrat. 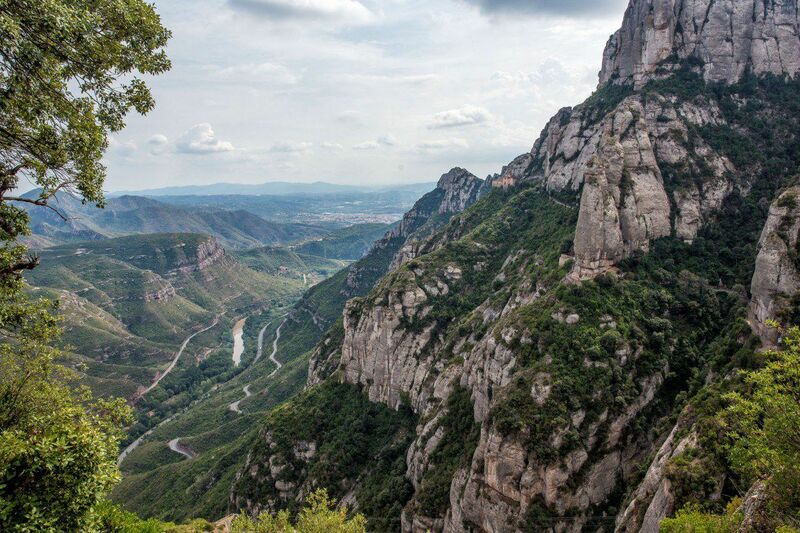 Montserrat is easily accessible from Barcelona. 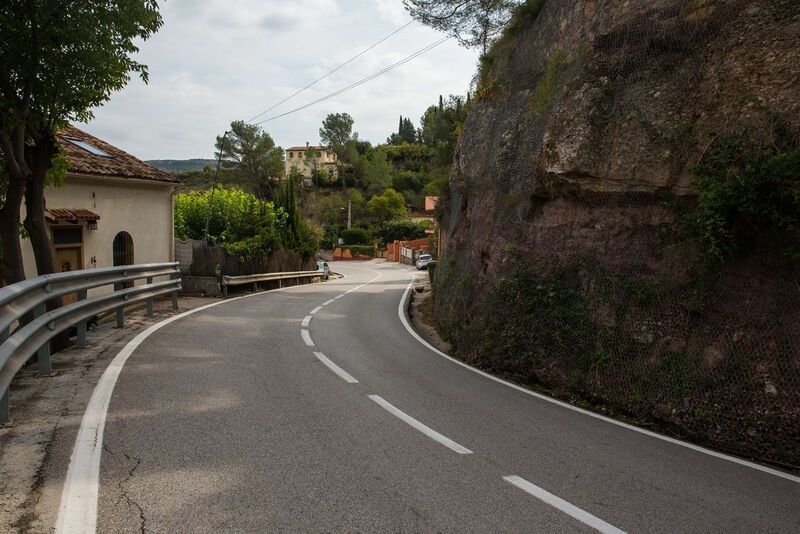 The distance between Barcelona and Montserrat is 54 km. 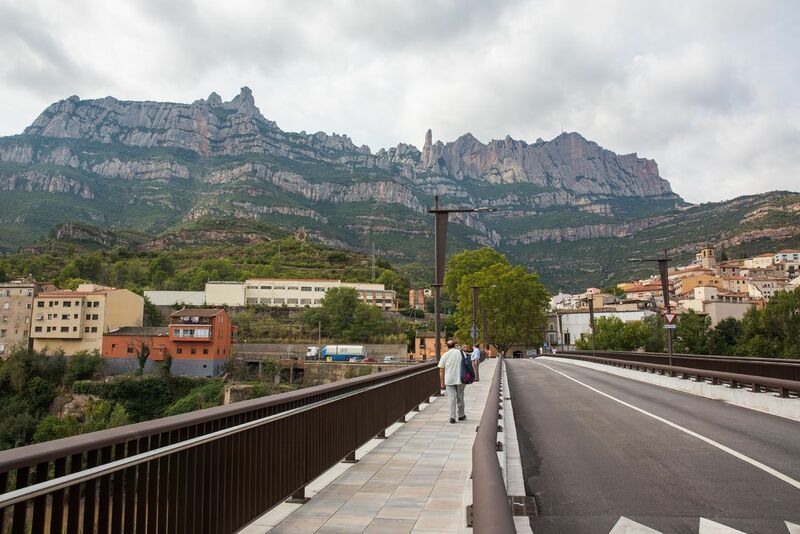 Most people take the train out to Montserrat, connecting with either the cable car or rack railway to get to the top. 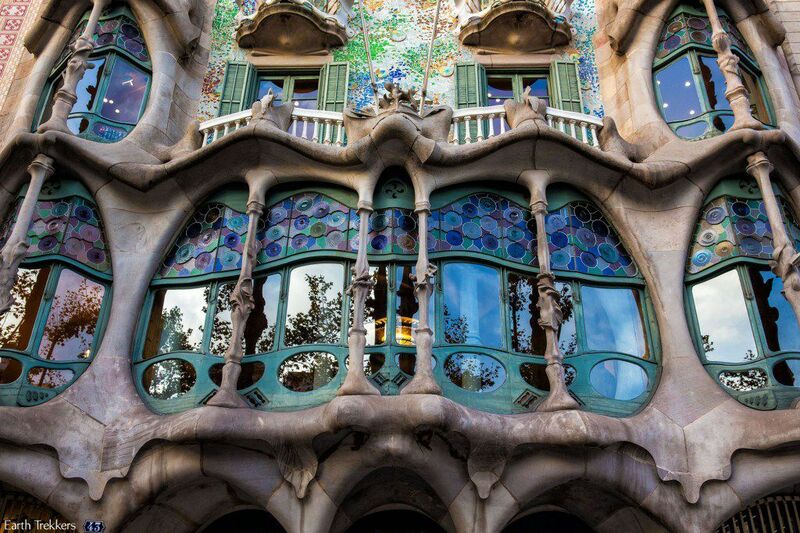 For details on how to do this, read our post How to Guide: Day Trip to Montserrat from Barcelona. 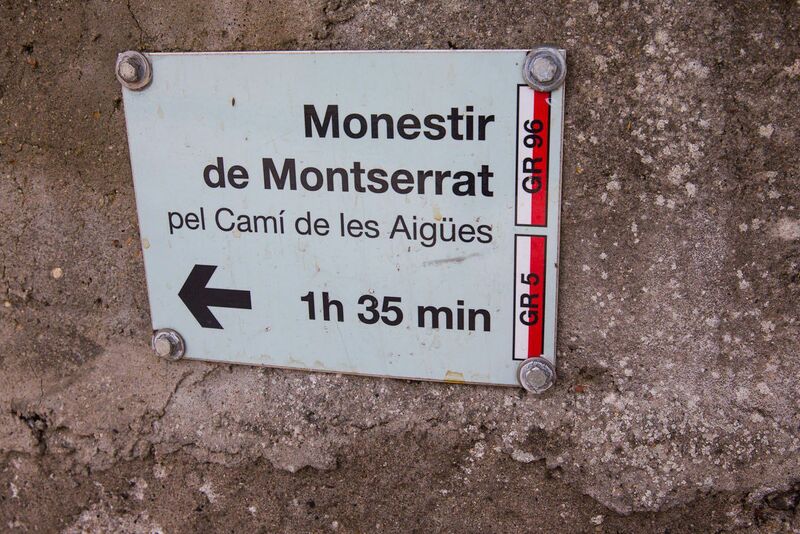 To start the hike, you need to get to Monistrol de Montserrat. 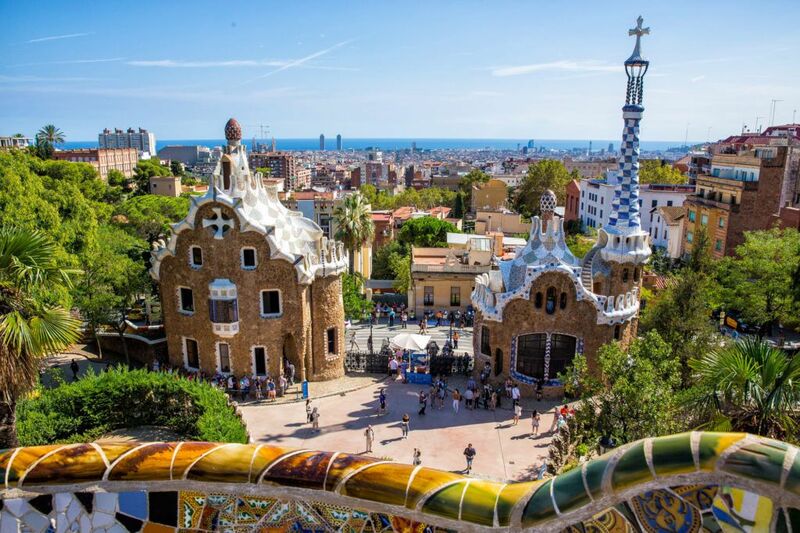 From Plaça Espanya in Barcelona, take the R5 train to Monistrol de Montserrat. It takes approximately 1.5 hours to get to Monistrol. Finding the trailhead can be a little tricky. We found very little information on the internet before attempting this hike, so we were in for all kinds of surprises. After asking for directions from several people in town, we eventually found our way to the start of the hike. 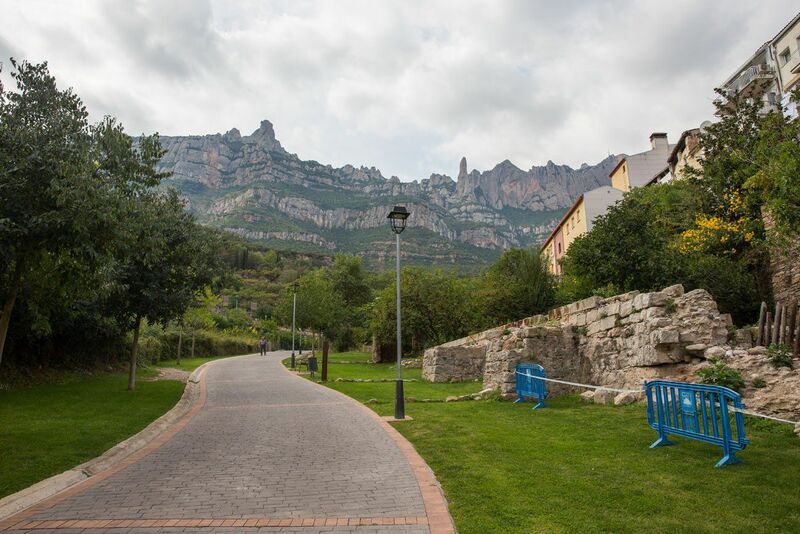 Here’s how to get from the Monistrol de Montserrat train station to the trailhead. 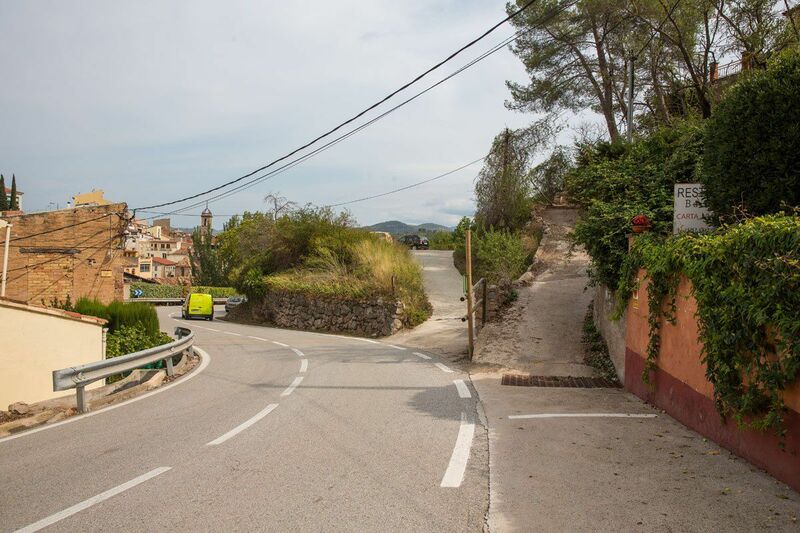 Exit the train station and walk downhill towards Monistrol de Montserrat. Cross this bridge to the other side. The mountain range of Montserrat is looming in front of you. Eventually, you will standing way up there! Once on the other side of the bridge, cross the street, passing between the two buildings in this photo. Continue on the wide sidewalk into town. The sidewalk ends at a small plaza in town. Walk through the plaza, keeping the mountains to your left. You will see a staircase off to the left. Take this to the road above you. Red, white, and green painted stripes mark the trail all the way up to the monastery. As long as you follow these stripes you are going in the right direction. From the top of the staircase, turn left and walk along the road. 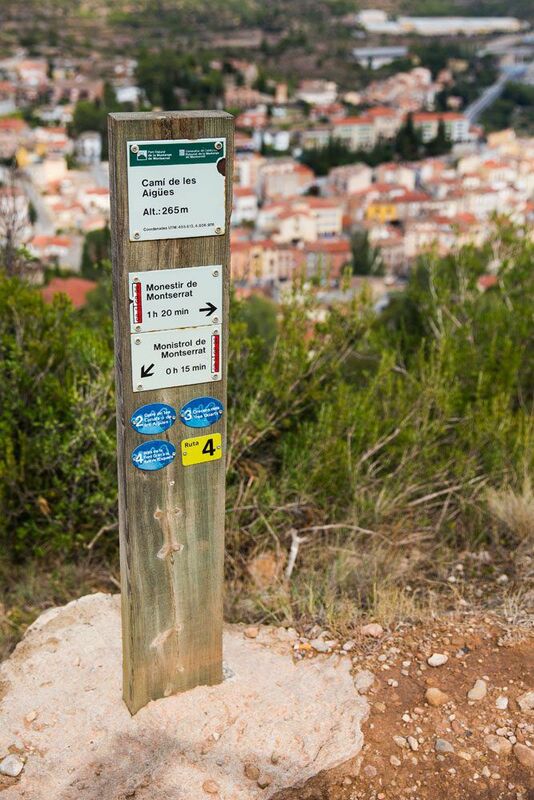 After walking approximately 100 meters on the road you will arrive at the trailhead. In this photo, it is the small, paved trail to the right. On the concrete wall there is a sign identifying the official trail. From this point it takes about an hour and half to get to the monastery, a little less if you are a fast hiker. Most of the trail is a rocky, dirt single track trail. Occasionally there will be small sets of stairs when the climb is a little steeper. It may come as no surprise that the trail is a steady, uphill climb all of the way to the top. Another sign on the way up the mountain. About a third of the way up to the monastery, the trail will split. Here you have two options. 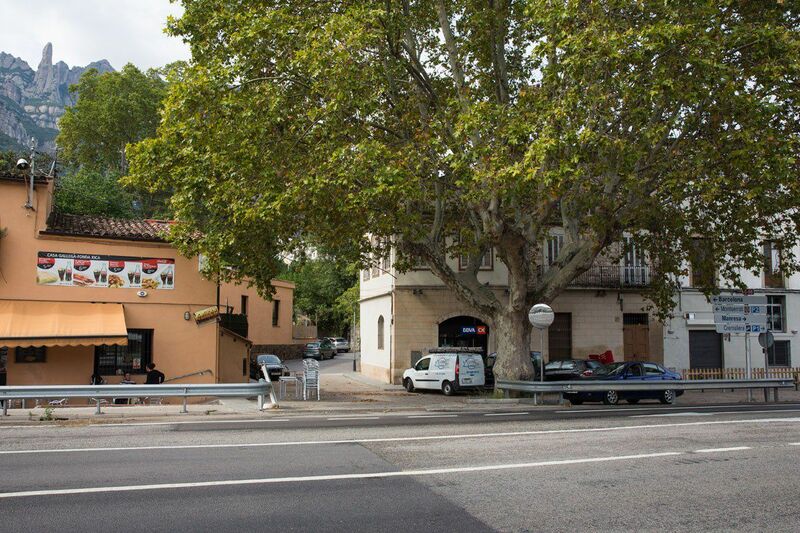 The easier option, staying on the Cami de les Aigues (GR 5), veers off to the left. This wide trail slowly meanders up the mountain. It ascends less quickly, making it easier, but it also takes five to ten minutes longer to get to the top. Or, you could take the Drecera dels Tres Quarts (GR 96). 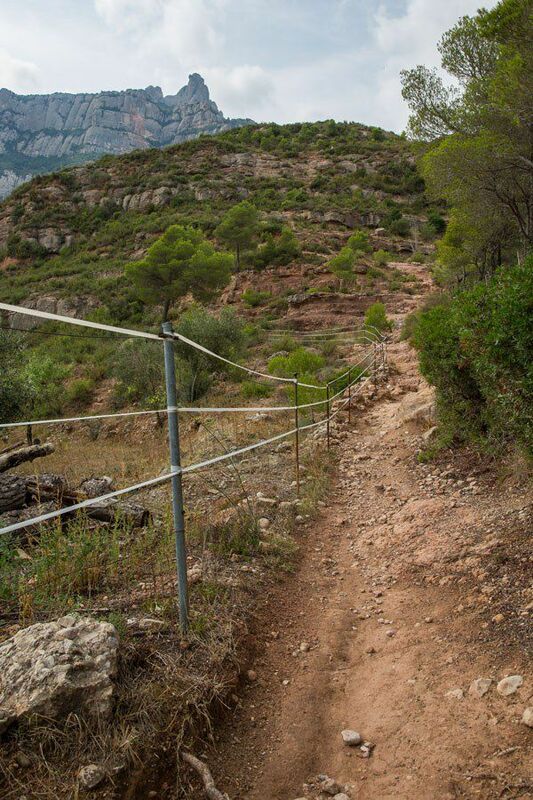 This trail is narrower, steeper, and more direct to the monastery. We chose the GR 96, preferring the quicker option. Here’s a view of the trail before the real climbing began. Just before reaching the monastery, both trails link up again. From here, enjoy the view. 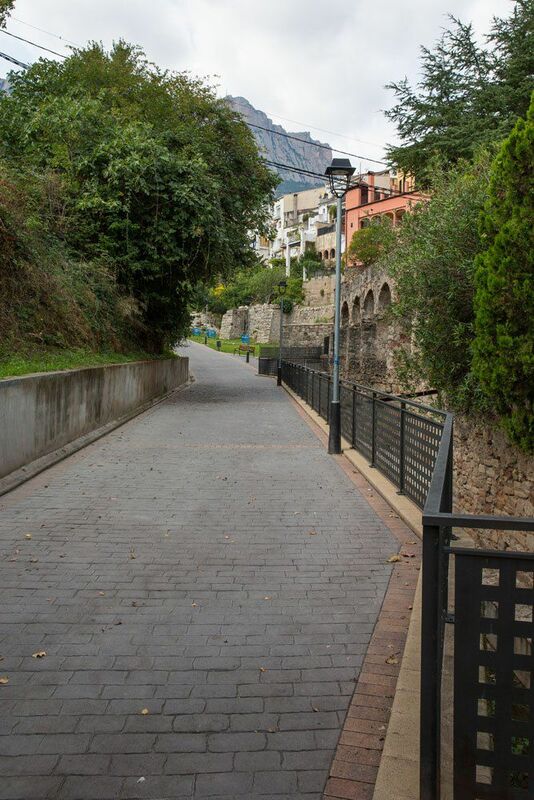 You can walk out to the Santa Cova Chapel (you can see it in the photo below, way off in the distance), hoof it up higher to the monastery, or choose to take the Santa Cova funicular if you’re all out of energy. 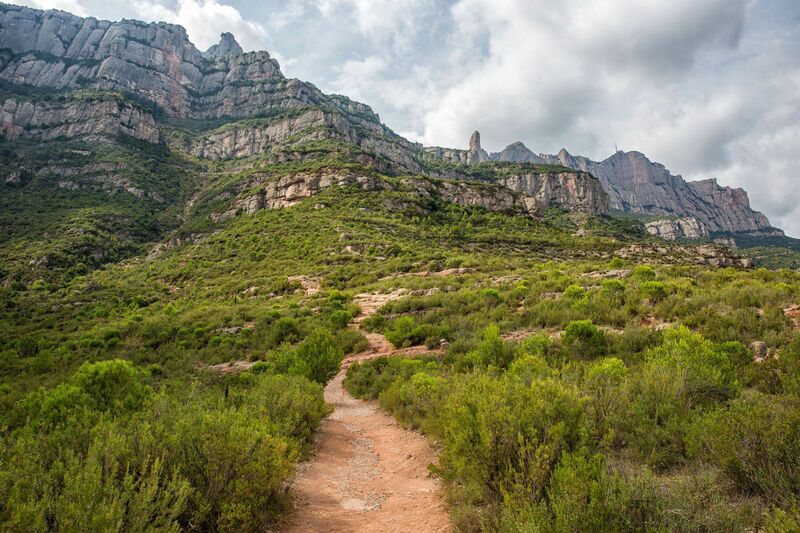 For a full list of what there is to do once you’re at the top, check out our post How to Guide: Day Trip to Montserrat from Barcelona. 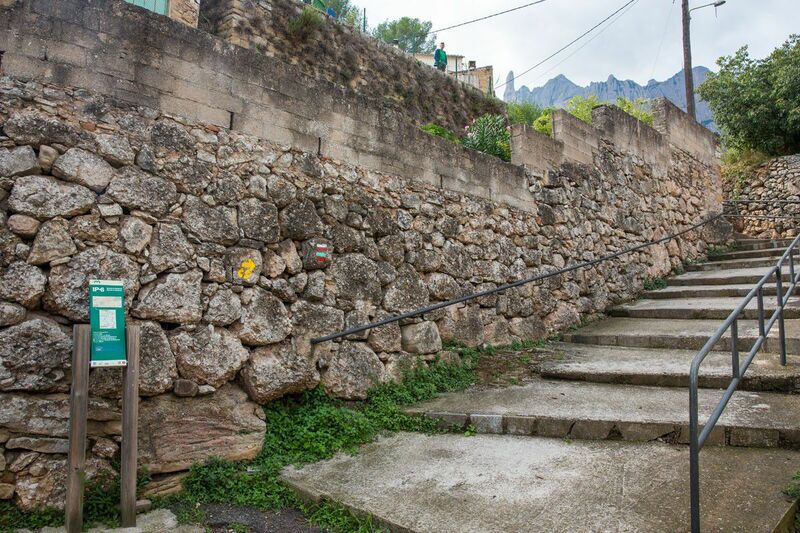 You have three options to get back down the mountain…retrace your steps and hike back down, take the cable car to Aeri de Montserrat (the cable car), or take the Cremallara (the rack railway) to Monistrol de Montserrat. 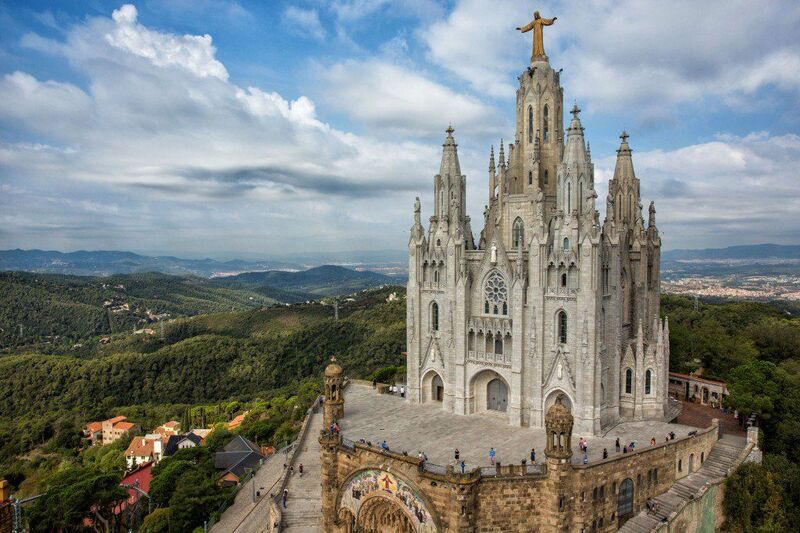 From Aeri de Montserrat and Monistrol, take the R5 train back to Barcelona. Tickets can be purchased in the train station. Print This Before You Go! If you are planning on doing this hike, print this out beforehand or cache it on your phone so you can follow the photos to the trailhead. 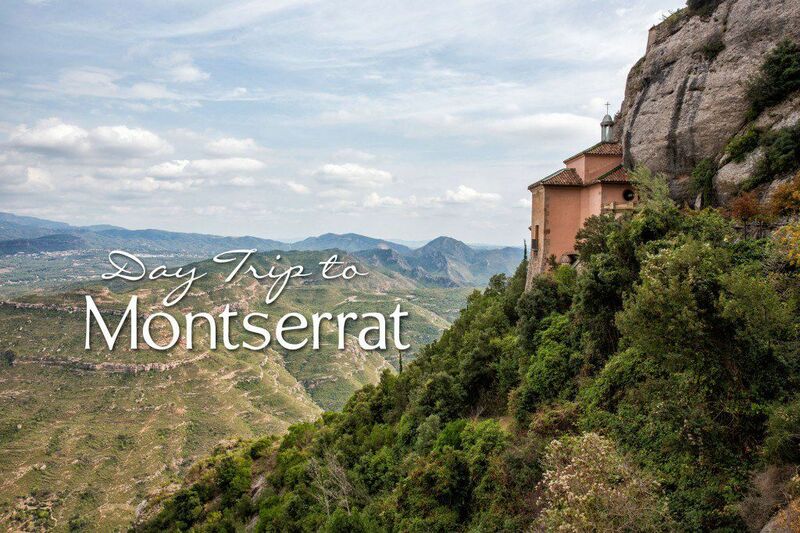 I am going to Monserrat in April and would love to print this guide out. However, I am unable to print it as the file is too large? Is there any way you could send it to me so that I could have it on hand for our hike as it looks extremely informative and helpful! Hey guys, I just wanted to say a massive thank you for this guide. 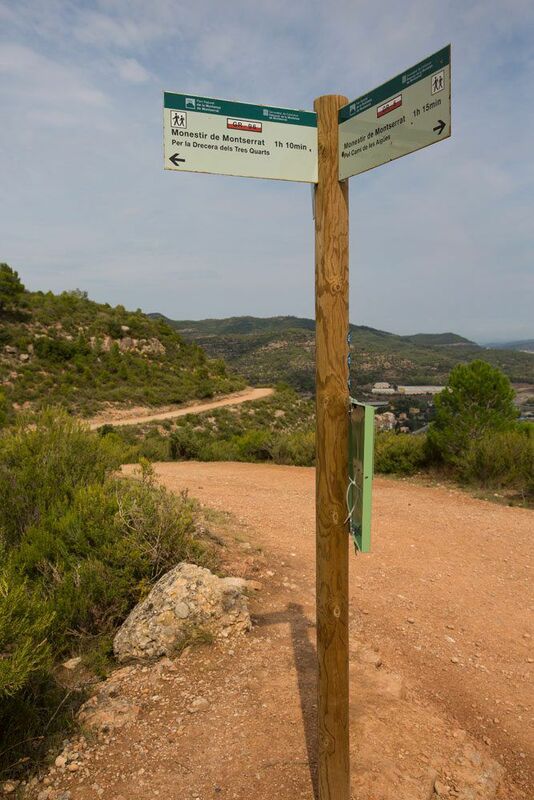 Me and my partner have just come back from a trip to Barcelona and we decided to hike up to Montserrat only because I had stumbled upon this post while planning the trip. We didn’t have a single trip-up, your directions were very easy to follow and made it extremely clear on the day. Thanks so much for sharing this as it saved me hours of research before our trip as well as saved us from trying to find the trailhead ourselves. Thanks again for this brilliant guide! We’re on our way back to Barcelona from a great day at Montserrat. The guide worked perfectly, and it was such a lovely (cold) hike… Thanks for sharing. The pictures were so helpful! Thanks for directions! I just did it with great December sun. For anyone driving it looks like there’s a small car park when the trail crosses the road. I didn’t use it but saw some hikers there and think it looked more convenient than where I parked. Thank you so much for your insight. It was a beautiful hike and with your guidance, it was very easy to access. Keep up the good work!